At the peak of football festival here at IIT Bombay, SOM kicked off its PG inter-department football campaign with the first match with Mechanical on 12th Jan. On what is called “a chilly night” in Mumbai, the squad of 7 stepped into the battle field in a knock out championship, you lose one game and you go packing home for the whole year. With Aakash’s watchful eyes guarding our goal, Mishra and Dhiman stood like solid rocks in the formidable defense. Kapoor, solely took responsibility of the defensive mid, feeding the ball for the attack. With that kind of wall guarding our wood work, Probal, Jerry and I started the task of wreaking havoc on the opposition’s wood work and when I think of it, yes it was a barrage of shots that the opposition had to deal with. With Patel, Ashwin and Prathamesh to replace anybody who came on a stretcher, I was sure we were going places. Come to think of it, no one had played together before, but when we were in the field, the chemistry was such as if we always played together. 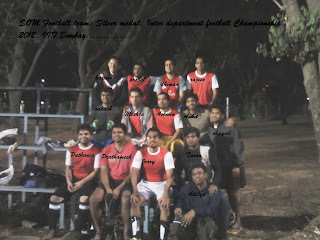 One touch passes, through balls, lobs from the midfield, solid clearing by the defense, bruises here, a stud rammed in the shin, a shirt torn there, blood spilling from the jaws, awesome saves in the goal, sledging, penalties, abusing the ref, SOM junta cheering from the stands and what not, this championship had it all. On 12th, as soon as the Finance class was over we all from SOM13 hurried for the field excited to shoot the ball in that wood work , only realize that it was a trap set by the sly Probal (captain) to force us innocent juniors into a painful, tiring and boring warm up and stretching L.
The First match was a gala of awesome passing in the attacking area with Jerry mesmerizing us all with his three clean goals and the awesome defense maintaining a clean sheet. I sometimes wonder if this guy Jerry is a basket ball player, considering the fact that he played inter-IIT this year or a football player, considering the other fact that he plays such a good football too. Whatever it may be, we came, we played and we conquered. Next day it was Mech, yes a lot of people told us they were a tough team and tough they were, with 3 six feet and above bodybuilders in their defense, clearing the ball at every opportunity. Full time didn’t see any ball behind the net. The game went into penalties. It is kind of stressful you know, when around a hundred people gather around that one goal post and bet their department’s respect on your shot and you have to go there and convert it. I can say because I know, I was there to shoot the third penalty (which thanks to the almighty went in), it is very stressful and there is only one thing on your mind- that rectangular goal. Five shots by both the teams and still no winner, the match went into sudden death and that is when Kapoor placed the ball so dexterously in that beautiful corner the goal keepers hate, that we all erupted with joy. Next day, two matches in one day, quarter finals with CSRE and semi finals with Chemistry department. 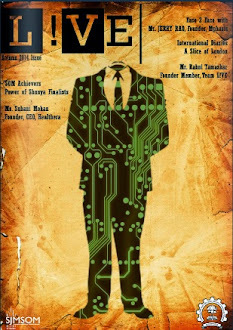 Well, all I can say is that CSRE did not come to lose and did not know how to lose, but that is how we sent them back. This match saw blood, literally. There wasn’t much that CSRE could do on the field other than pushing, crying and attacking and so we replied with a battering on their wood work. After that physically demanding match, I looked at Jerry. The semifinal was in two hours, we ran back to Satish (our best friend in H1, the owner of the H1 canteen). With 8 bananas in a carry bag for the others and huge glasses of shakes in our tummies, we were back on the pitch, ready for the Semi finals. This may seem ruthless on my part, but there is a no better feeling than watching a helpless and frustrated defense and by Jove, I watched Chemistry department’s defense that day with that ruthless and sarcastic smile on my face that day, as we passed and shot on their goal post like cowboys running wild on a shooting spree. The only chance they could manage was blocked by Aakash with a save that would surely be remembered for long. The score board at the end showed four goals to nil. It would be worth mentioning that Chemistry dept was the department that showed us the door in semis last year. This year the tables were turned. 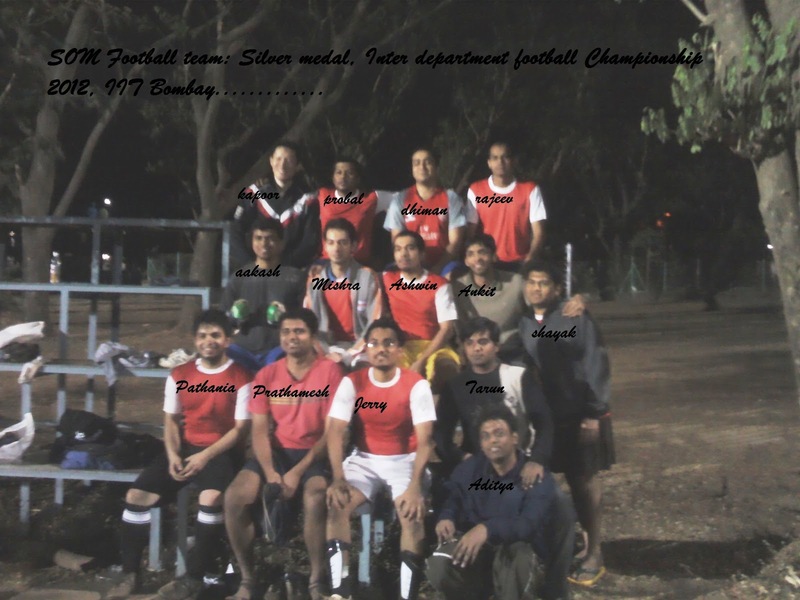 SOM football team thus became the talk of the town. Students caught up with me in the mess to congratulate and wish us luck for the finals. Of the 23 departments that tried their mettle, SOM and Electrical were to battle it out for glory and yes, there was a crowd from SOM cheering us that night in the field, and yes, there was our marketing professor that night in the field to watch the big game. That is how we went into the field with all our guts to make a difference that night. We fell, got up, didn’t even brush off the dust, fell again, shoulders rammed against shoulders and what not, believe me if you can, each of us gave all we had in us to that match that night. Even when the battered body said a hundred times, “you can’t run more”, we ran like the wind. But that fateful day, Electrical managed one goal behind our defense line and managed to keep a clean sheet. That was all for the night. We lost the big game. It’s GC (inter hostel football tournament) from tomorrow, H1 faces H14 in the first match or in other words SOM13 faces SOM12, team mates today, opponents tomorrow. We lost the gold this time, but I am happy, because we played well; silver medal is what we take home. Last year SOM went till semis, this year finals, next year the prediction can only be the gold medal. Let us see if SOM14 can stand up to the challenge. What I take back from this tournament is that I played with an awesome team. A team where each player understands the other, a team that plays together as one, that respects the opponents and yet tears them apart in the field, a team that earned respect of the institute with its sweat and blood, that gets into a huddle before every match for the victory call………. 1 2 3……SOM!! !